Breaking Bad tributes aren't hard to find. We've seen an entire episode translated into emoji. We've seen the show's theme played on equipment from a meth lab. We've even seen a Breaking Bad Lego set. But this new website might be the most obsessive tribute yet. 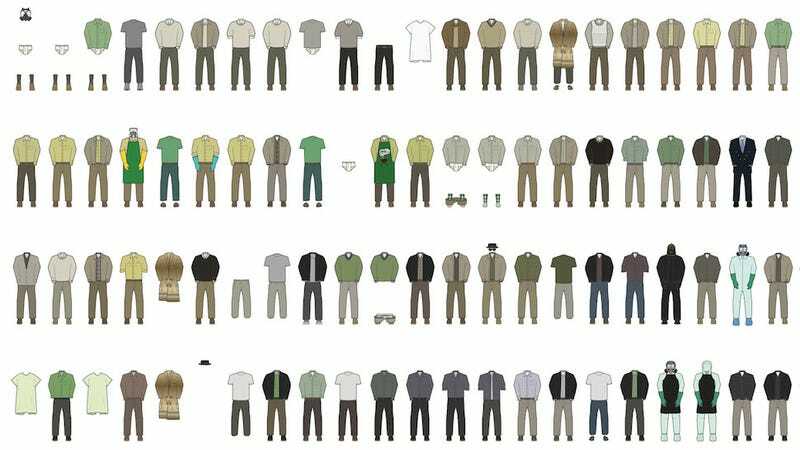 Put simply, it's a diagram of every single outfit Walter White ever wore on Breaking Bad. From the gas mask, white briefs and boots to the many head-to-toe hazmat suits, the illustration does a good job showing how show's protagonist was many characters at once. It also showcases well one sometimes pitiful and sometimes hilarious truth: People are having a really hard time letting go of Breaking Bad.